In case you had any doubts about where the war in Libya is going, the Pentagon has admitted today that two new weapons are now part of the coalition forces: The A-10 Warthog and the AC-130 Spectre. Vice Admiral "Shortney" Gortney admitted today that Warthogs and Spectres "have been employed" according to the United Nations' resolution 1973. He stressed that they are not being used "in direct support of the opposition." However, that's exactly the purpose of those planes: To provide close support to ground forces. What do these war planes do? The Fairchild Republic A-10 Thunderbolt II aka Warthog is a twin-engine jet designed to provide close air support for ground forces. It eats tanks and any armored vehicles for breakfast, lunch and dinner thanks to its GAU-8 Avenger heavy automatic cannon. These beasts can take an entire Libyan armored column and blow it to smithereens in a few passes. The Lockheed AC-130 Spectre is a gigantic flying gunship that vomits hell down to the ground in the form of 20mm, 40mm and 105mm cannon projectiles, some of them of the delicious depleted uranium kind. 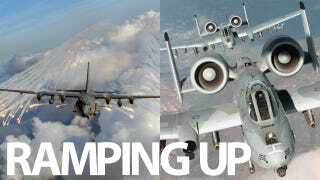 The main use of the AC-130 is close air support, force protection, and bombing raids. If, according to the Pentagon, these aircraft are "not being used in direct support of the opposition" forces, did they just sent them there on target practice? No. The Pentagon may pretend that these airplanes are not providing close air support to the rebel forces but the fact is that, when you take one of Gaddafi's tank out of the way, you are directly supporting the opposition. Perhaps not in a coordinated way, but in a definitive way nonetheless. And while the rebels aren't necessarily calling coalition planes in when they need support, I think it's safe to assume that recon units—either drones and/or special operations units on the ground—are guiding these attacks to the places and battles where they are needed the most. In fact, you need to have recon units for these planes to operate correctly and kill the bad guys, not your friends.